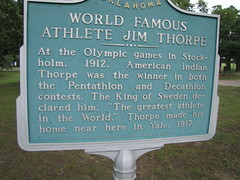 At the Olympic games in Stockholm, 1912, American Indian Thorpe was the winner in both the Pentathlon and Decathlon contests. The King of Sweden declared him "The greatest athlete in the World." 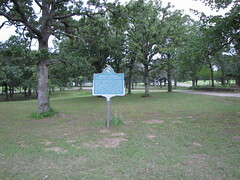 Thorpe made his home near here in Yale, 1917. Jacobus Franciscus "Jim" Thorpe (Sac and Fox (Sauk): Wa-Tho-Huk) (28 May, 1888 – 28 March, 1953) was an American athlete. Considered one of the most versatile athletes in modern sports, he won Olympic gold medals in the 1912 pentathlon and decathlon, played American football at the collegiate and professional levels, and also played professional baseball and basketball. He lost his Olympic titles after it was found he was paid for playing two seasons of Semi-Pro Baseball before competing in the games, thus violating the amateur status rules. Thorpe was Native American Indian and European American. Raised in the Sac and Fox nation in Oklahoma, he was named Wa-Tho-Huk, roughly translated as "Bright Path". He played on several All-American Indian teams throughout his career, and barnstormed as a professional basketball player with a team composed entirely of Native Americans. 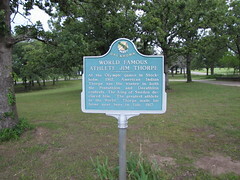 In 1950, Thorpe was named the greatest athlete of the first half of the twentieth century by the Associated Press (AP). In 1999, he was ranked third on the AP list of top athletes of the 20th century. 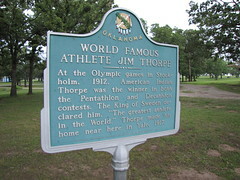 His professional sports career ended in the years of the Great Depression, and Thorpe struggled to earn a living. He worked several odd jobs, struggled with alcoholism, and lived out the last years of his life in failing health and poverty. In 1983, thirty years after his death, the International Olympic Commission (IOC) restored his Olympic medals to his name.